I finished my fall mantel today and couldn't wait to show you! This one is very different from previous years...but I still have my orange for autumn! However, this time I pulled out some of my favorite blue and white chinoiserie to add to the mix! I love the contrast of the orange pumpkins with the blue and white! Many of the pieces were thrift store finds or are very old treasures from my first days of decorating my own home. I added a few little snippets of faux bittersweet...a Pier 1 bargain garland that I don't mind cutting up since it only cost $3.50 (instead of the $35 it had been priced)! It was also used in the Pottery Barn inspired fall wreath on my front door. Love the crazing on this pillar candle stick! This nicely-shaped bowl is an old favorite of mine! Can you tell that I love blue and white? You can see peeks of my collection in other rooms reflected in the mirror! ...wrapped around a grapevine wreath that had become a favorite of Miss Kitty's. Don't worry...I found another one in my stash and put it on the bed for her! Can you see into my dining room? A little peek at what is to come...more blue, white and orange! I debated about changing the white grape patterned plates on the mantelpiece for blue and white, but decided that would be too much! What do you think? And there it is! I still have a lot to do to get ready for the All Things Home Fall Tour! Don't forget to mark your calendars to come by on Wednesday, September 25th for a virtual peek into my house all decorated for fall! 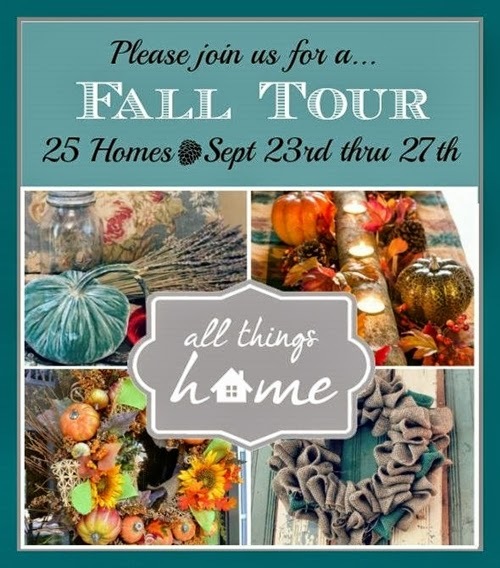 The tour will start on Monday, September 23 and go through Friday, September 27th with five homes to see each day. You will find a complete schedule here or on my sidebar. We are all spiffing up our homes and getting ready, so be sure to visit each day! Thanks for stopping by! I hope you enjoyed having a peek at my fall mantel! Please visit these wonderful bloggers and their beautiful blogs to see what they are up to and to find a list of this week’s participants! This is beautiful-I love blue and white. The orange looks wonderful mixed in. I too the blue and white. What you have done is so pretty and has inspired me to pull some of mine out to use in my fall display! Thanks again for sharing! Debbie, I love your blue and white! I'd love to run up on some of the faux bittersweet! You sure put it to good use! I like the white plates on the mantel! Beautiful as always! Debbie beautiful as always, you are amazing!! I love seeing all your blue and white dishes and vases. I love the bittersweet used as an accent adds a nice piece of nature. I continue to watch you in awe!!! Stunning, Debbie! I love that you mixed blue/white with vibrant orange pumpkins ... they work beautifully together! love the blue and white, and the orange just makes it all pop! Debbie I love the pop of orange with the blue and white. I like leaving the white plates as is, this way the eye isn't drawn from the mantel down! What a fun Fall decor you have this year! Pretty! I think you should try the blue and white in place of the white grapevine plates. It might bring the eye down a little and make the mantel appear larger. You're the one who has to look at it each day though, so it's ultimately up to you. I just love blue and white so much. it looks excellent with the pumpkins too! Thanks for the inspiration! Love blue and white and fall is my favorite season! Perfect combination!! This looks amazing! You are a contininuing source of inspiration for me, thanks so much for all your decorating inspiration and effort. Your blog is the first one I look for on my FB feed, and you never disappoint! Just love the orange wit the blue & white, I would never think to go there. It really works!! I love this. It is gorgeous. I agree with you that changing the white plates would be too much. It is just perfect as is. I added teal with my fall decorating this year and am loving it, too. I love, love, love the blue and white with the pumpkins! It is stunning. This is so beautiful and original - I absolutely adore what you have done. I am a blue and white lover, since this one spoke to me. Beautiful job!! Hi Debbie! Your mantel is just gorgeous! I love your blue and white pieces. No one does it better! Love sweet little fuzzy face too. I love your blue and white treasures. They are the perfect accent with your pumpkins, just gorgeous! Your blue and white mantle is a fresh combination on fall decorating with orange pumpkins. Creative and using timeless fall pumpkins in a new setting. I think you made the right decorating decision to leave the white plates on the fireplace. I'm looking forward to the Fall Home Tours next week. I love the blue and white with the pop from the orange pumpkins! Beautiful, Debbie! I love the blue and white pottery with the orange. ps: I'll be posting about the bucket I got at Walmart after seeing your post. I love the orange of the pumpkins with all your pretty blue and white. I vote for the white plates. They are perfect! Can't wait to see the rest of your home dressed for fall. Your blue and white chinoiserie china is absolutely wonderful... I can see more blue and white in yur dining-room already! That is beautiful idea. I love my blue and whites. The mantle on top is kool. Curious to see what the under part looks like with your white plates on it. I have lots of various blue and whites and curious what to do with them. Could be an idea!! Keep on inspiring me!! Hi Debbie, Oh, it's so beautiful! I enjoy your blog so much - thank you! So beautiful, Debbie! I just love the blue, white and orange combined together. Boy is that gorgeous Debbie! You can work a mantel. I never think of blue and white as fall colours but I LOVE how the orange pops when you combine the B&W with it! Love seeing something different that looks so great! I think you are right, replacing the white plates for B&W might have been too much. I like it how it is. Have you had your color wheel out? Blue and Orange! Perfect together. Love this mantel -- I adore blue and white, and adding that orange just makes it all zing. And Miss Kitty is the cat's meow... but you already know that! I love how you added orange to your blue and white. Inspiring me to re-think my fall decor for next time. Love your color combination! It's so unexpected. I have a "helper" like Miss Kitty who always wants to be in the middle of blog projects. I'm visiting from the Thrifty Decor Chick link party. Debbie, The blue and orange tighter are just beautiful. What a treat seeing all your beautiful blue and white. I like the white plates on the fireplace and I can't wait to see your dining room. I love the contrast of the orange pumpkins with your beautiful blue and white pieces. So Pretty! I love blue and white too, and still have it around the house, feeling like I should make a change but not wanting to. So last week I started by adding sunflowers to one vignette and have been thinking about continuing with that theme. Yours is absolutely lovely. Great job! The blue and white contrasts so nicely with the pumpkins! What a different way to bring fall into your home - I love this!! I love your mantel! The blue and orange is striking, beautiful! I am such a fan of your blue pieces. I love when you show them and wow, love them with the orange. What a gorgeous combination. I like this look a lot! I definitely like the contrast of the blue/white and orange. I agree with keeping the plain white grape plates. It allows your eye to enjoy the mantel and doesn't compete. Great job! I think this may be my favorite of all of your posts. Love all of the blue and white set against the orange. Spectacular. Debbie, I think your mantel is gorgeous. LOVE LOVE the pair of blue and white urns, and the large bowl in the center. The orange really pops with the blue and white. Well done!! How fun to have found your site! I too have a thing with dishes...I call it my "dish fetish" :) I love your blue, white and orange mantel! Looks like home to me...blue dishes all year 'round.